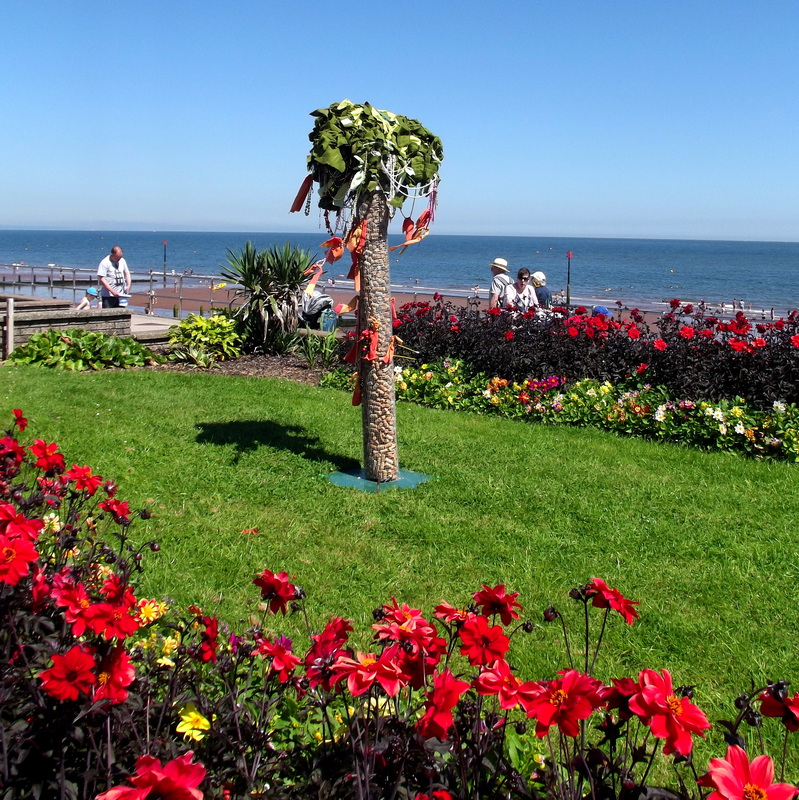 3 weeks have passed since I erected my sculpture on Teignmouth sea front and look how it has changed!!! I had no idea if anyone would want to join in with my interactive piece, but it turns out that they really, really have! Today’s photo is on the left, 3 weeks ago on the right. See my previous post to see how and why I made it. 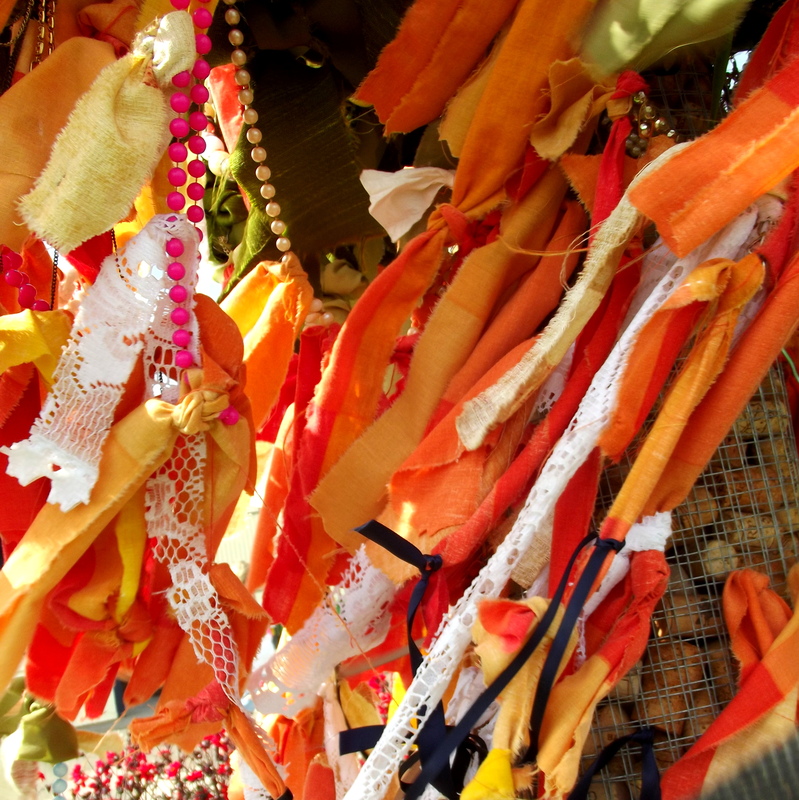 Literally hundreds of wishes have been tied to my tree, at least 4 pairs of curtains, an old double duvet cover and goodness knows what else; I am really chuffed that now people have started bringing their own strange trinkets and special bits to add to the tree. Thanks to unknown members of the public who have refilled the bin with scraps of material in between my visits! 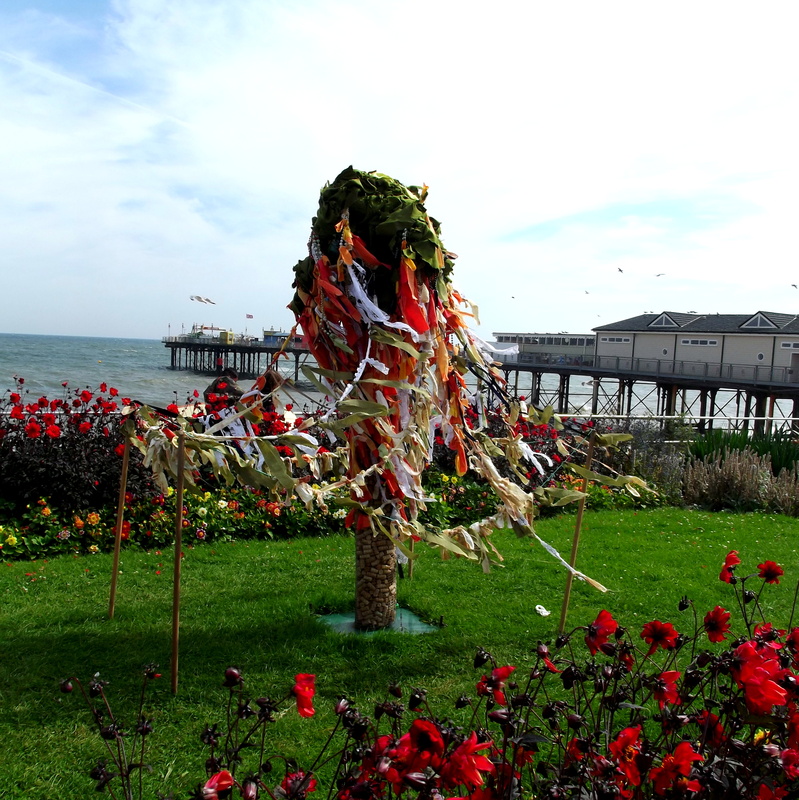 There is still plenty of time to add your own wish to my tree, it will be on the sea front till September and if it is still in good shape, back at mine for Open Studios in September. 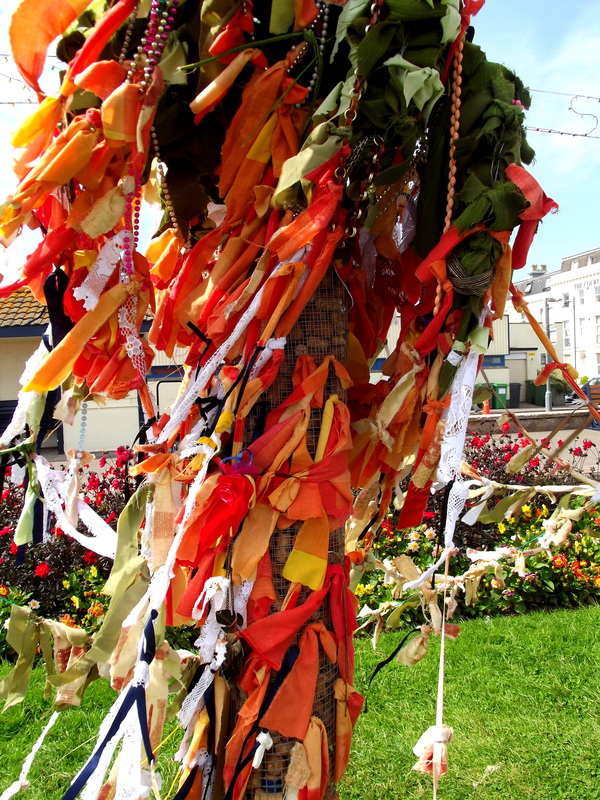 This sculpture is part of the TRAIL recycled sculpture trail on Teignmouth sea front. We also have an indoor gallery at TAAG in Teignmouth town centre. 2 months is a long time in blog land! Wow, my last post was 2 months ago! Where has the time gone? Some of it has been taken up with joining the writing team at UKHandmade where I am now writing the craft profiles section, which is proving to be great fun, though I hope my outpourings wont be too sporadic for them! which has helped me so much in the last couple of years (I received a bursary from them last year). 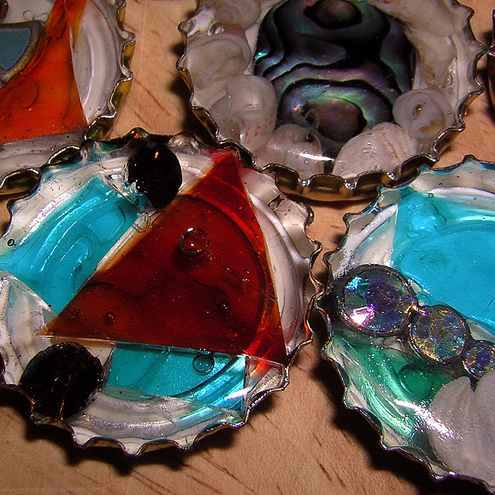 Things in the world of glass have been moving on nicely too! 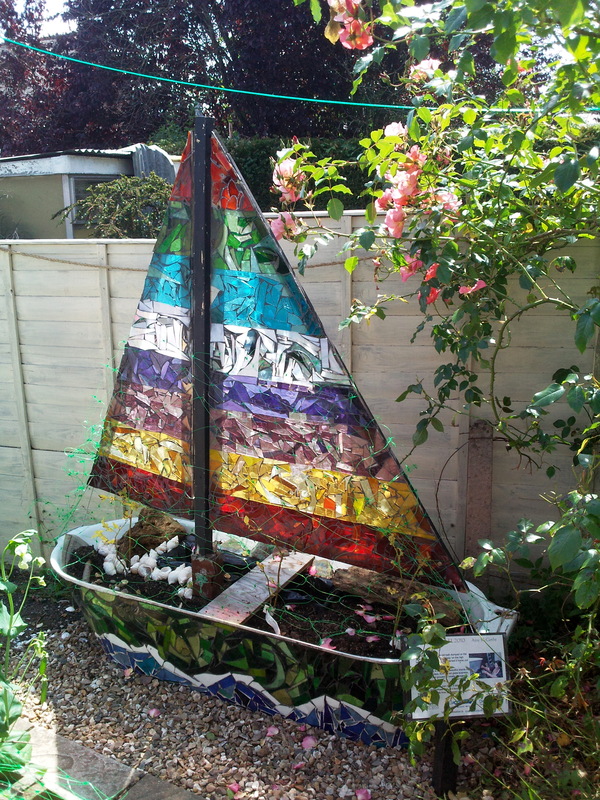 I have been furiously making boat mobiles and my other recycled seaside wares for Inspirations in Salcombe and Atelier in Barnstaple, who have put in their big summer orders. Summer is a really busy time for me as so much of my work is in galleries by the sea and the summer holidays are galloping towards us now! A gorgeous local chain of shops Insideout came to see me and I am working towards a launch type event with them at the end of the month, including some new designs just for them! 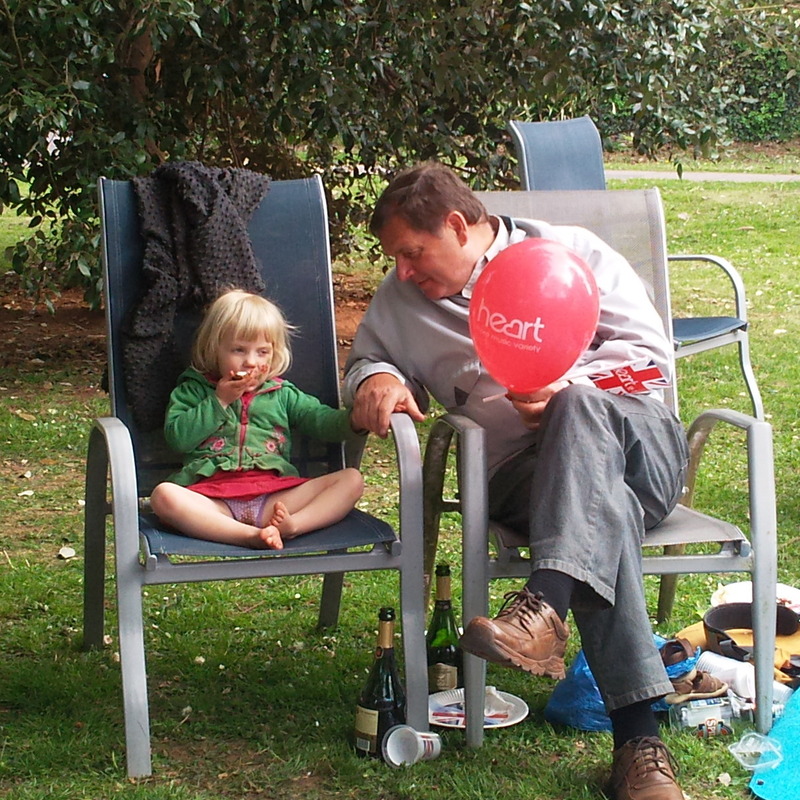 All my plans and activity stopped last weekend, our eldest daughter had a virus which made her very poorly and she ended up in hospital, thankfully only for a day. This experience made me especially glad that my work is part of the Devon Artist Network’s Art and Health Programme at the Royal Devon and Exeter Hospital . This initiative allows artists to display work to brighten up the corridors and waiting rooms of the local hospital, hopefully bringing a small distraction to the time spent waiting for appointments or news of loved ones. Baby bird is recovering well and thankfully self employment means I could drop everything to be with my children….but if you dont work you dont get paid! So I have been doing what I can in the house whilst she sleeps and the younger monkey is at nursery and thankfully I managed to deliver all my planned pieces today (which really was the last minute) for Gloss Gallery Summer Show: Coast and Country which opens Thursday 19th July. Phew! 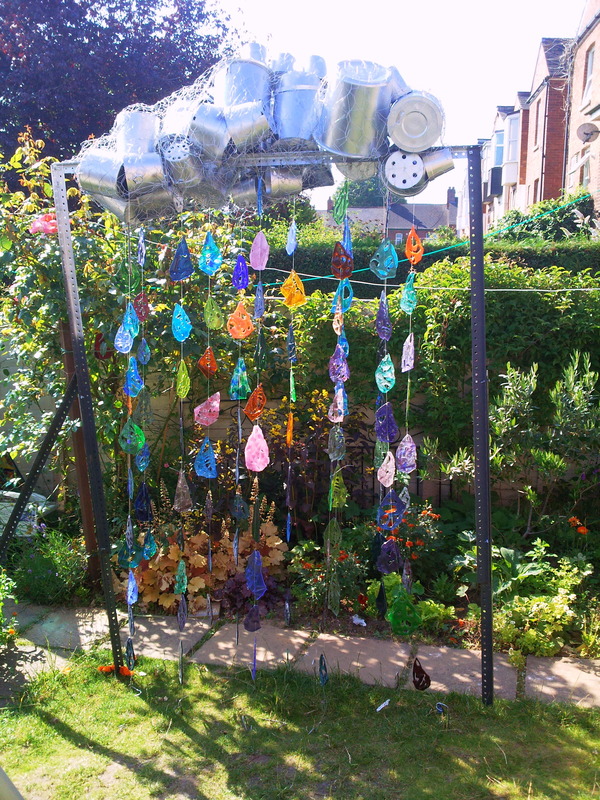 Now its onto the next project, my submission for the annual recycled sculpture trail in Teignmouth which starts next week, but I have only just started constructing! I was lucky enough to win this a couple of years ago and its a highlight of my working year; so I have been assembling junk to turn into my new sculpture….more on that soon but for now I need to get back to making it! 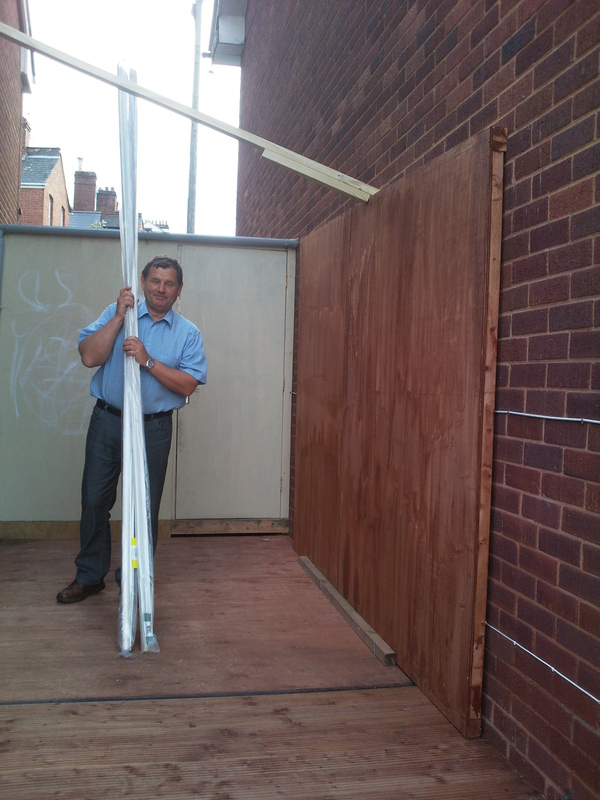 Fanfare please…..my new studio unvailed! 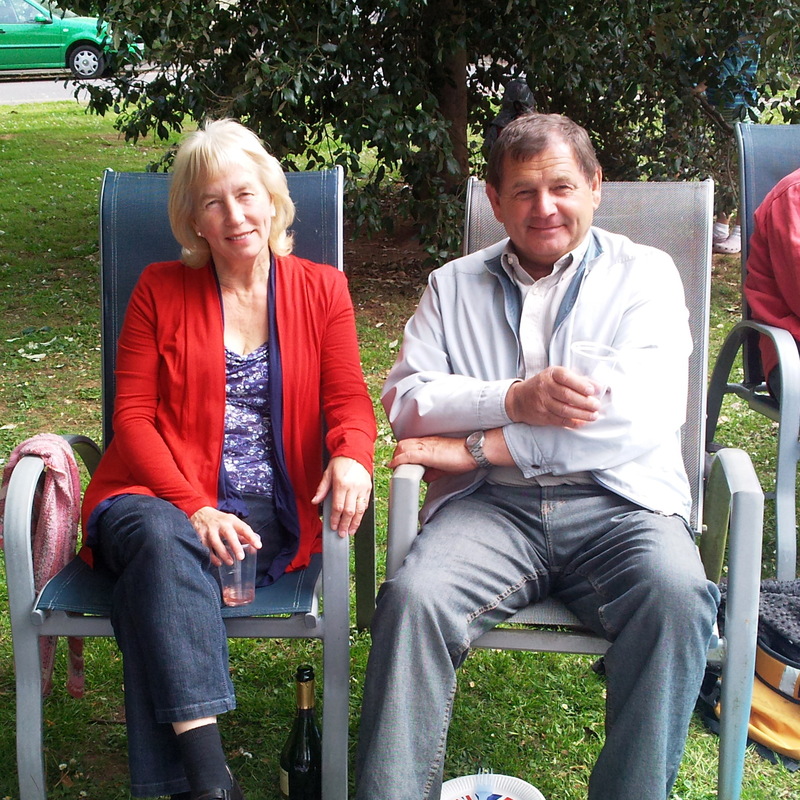 Bless my folks (there they are sitting down) who have spent the last fortnight either buiding me an extension to my existing workshop (Dad) or running around after my kids so I could catch up on some work (Mum). Both of whom did an amazing job. 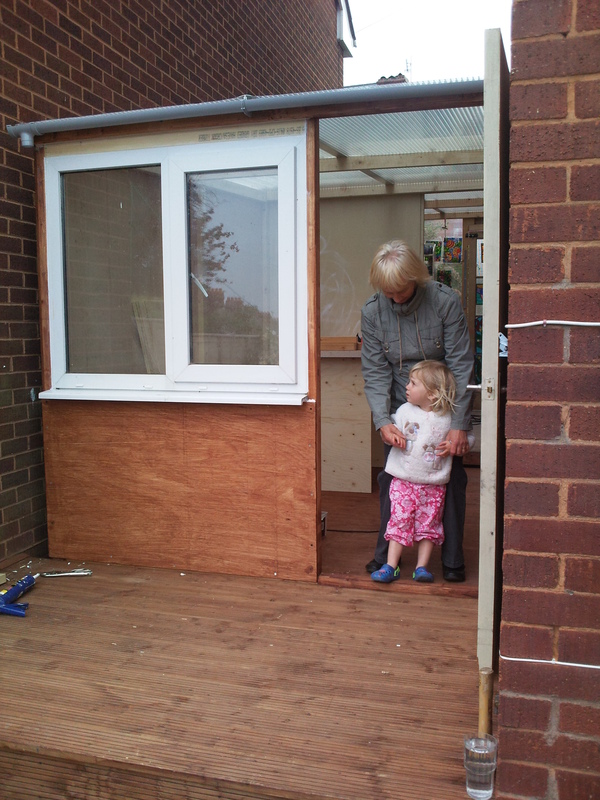 My Dad’s ability to make something out of nothing (a door and window from the recycling centre, some bits of wood, floorboards and sheet plastic) is a real skill. 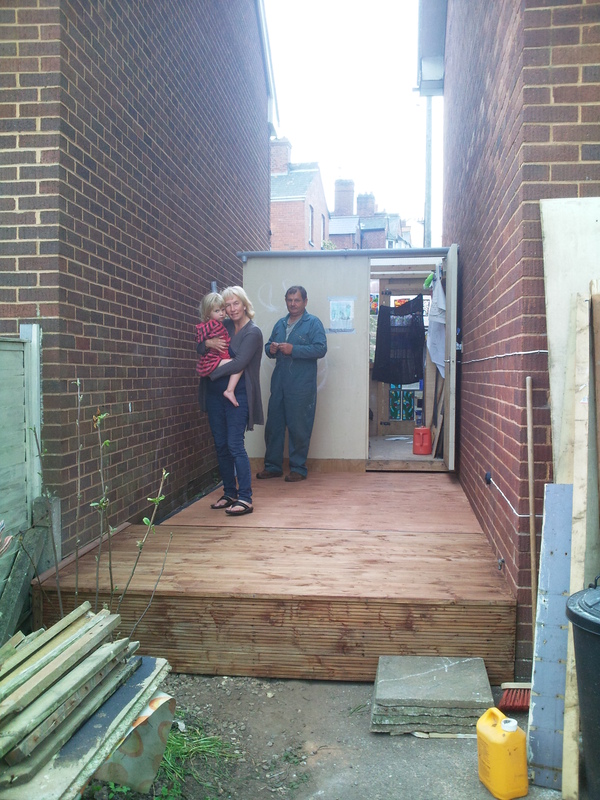 Our childhood’s were peppered with Dad’s various sheds, extensions to our house and other random building projects and when I ran out of space in the first one he built me he was happy to come and do the same again. Thank you Dad, I think you will agree he has done a fab job, as you can see we even let him have a day off for the Royal Wedding! 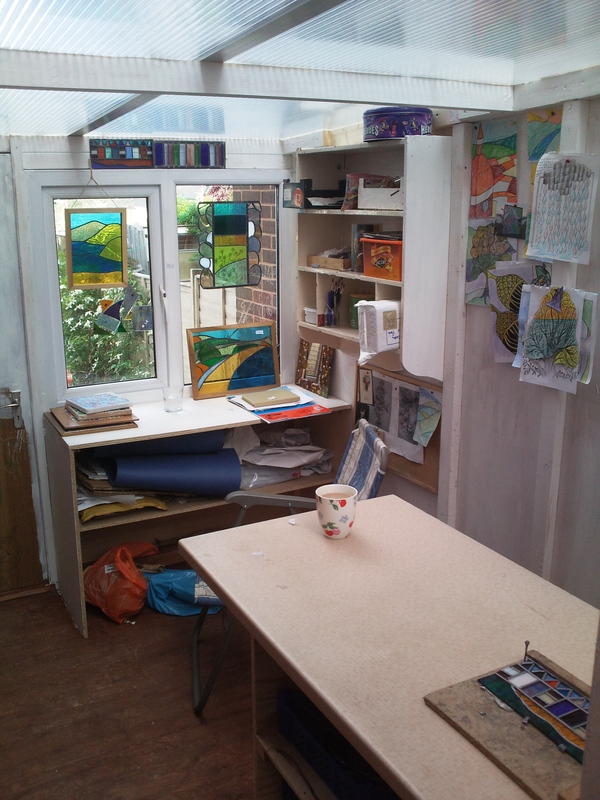 The extra space means I have a dedicated drawing area (looking out of the window onto our garden) a leading and cutting area, my light box is now usable cos its not covered in other work any more and I have a lot more storage. 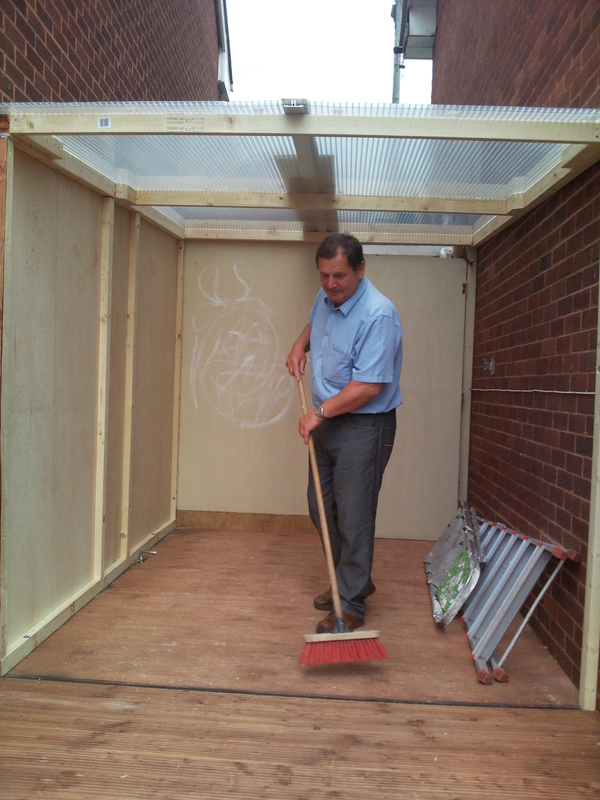 Due to the clear roof I have loads of natural light and it is a wonderful workspace, thanks so much Dad…now where was that list of things for you to do next time you visit??? Today was my scheduled day to finish a large panel I have been working on for (all stages of it being made and details are on previous post, click here), so I have spent the day polishing and finishing the details of the etching with an electric etching pen. I always do the pen etching right at the end as I don’t like the black stove polish to get stuck in the grooves of the glass. This is a slightly risky practice though as if there is a weak point in the glass the vibrations of the etching pen can crack it and just as I was finishing the last piece of etching on the border disaster struck, CRACK! 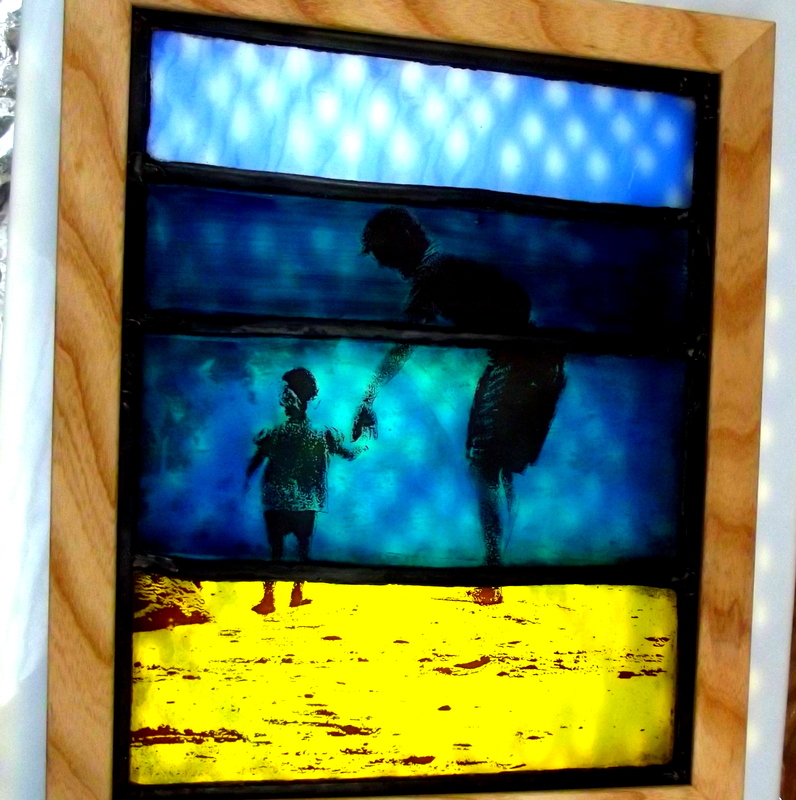 Thankfully it was only a very small piece of the border and I was able to replace the small pane of glass quickly, in order to take a couple of photos in the fading light and it will be delivered to its new home on Sunday where it will be fitted into a double glazed unit. Hopefully I will get some better photos of it soon. 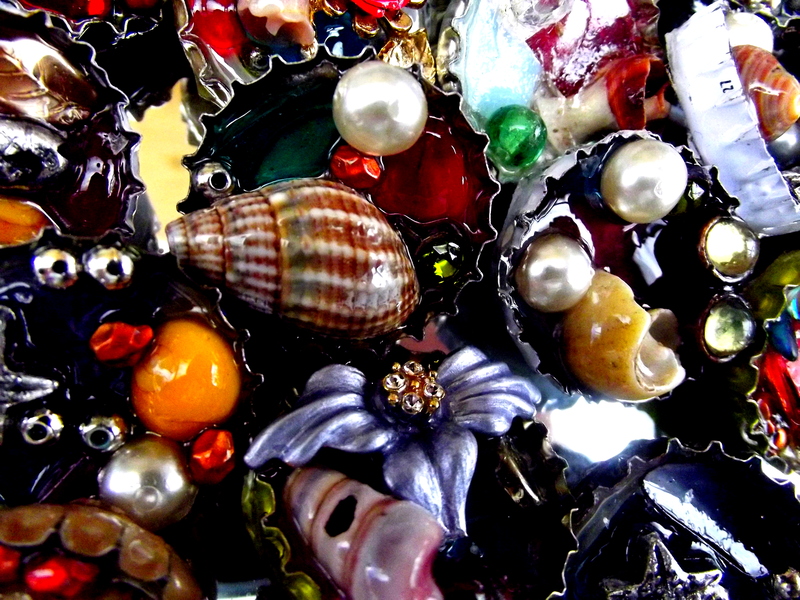 The border is made up of clear glass with seaside motifs, including acid etched shells and molded glass with seaweed patterns. 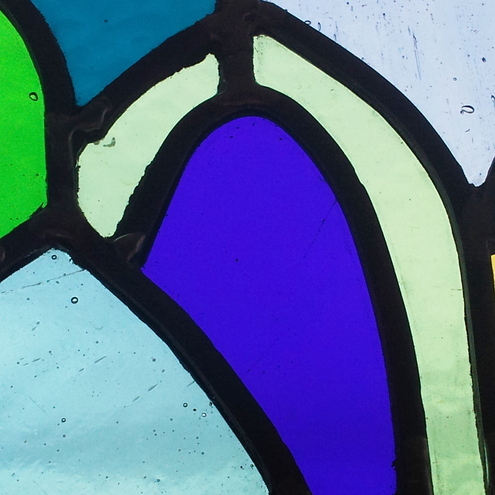 The main body of the panel is made from a mixture of different glass including spectrum, cathedral and wispy glass. The colours reflect the greens and purples of the hills around North Devon and the acid etching has come out very well in the main panel and the borders. 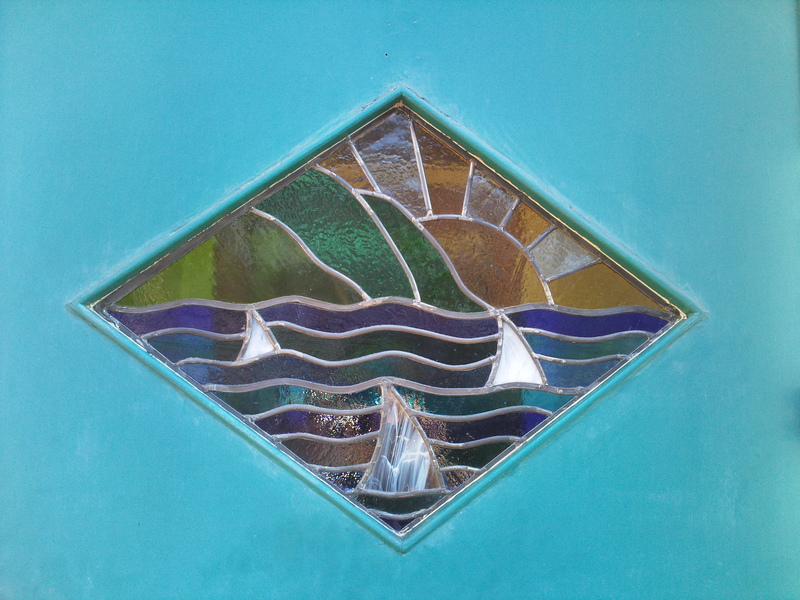 I am also really pleased to announce that I have been chosen as one of 5 Devon Artist Network emerging artists to recieve a bursary to pay for half of Devon Open Studios this year, which is timely as the family who commissioned this window saw my work in last years brochure! 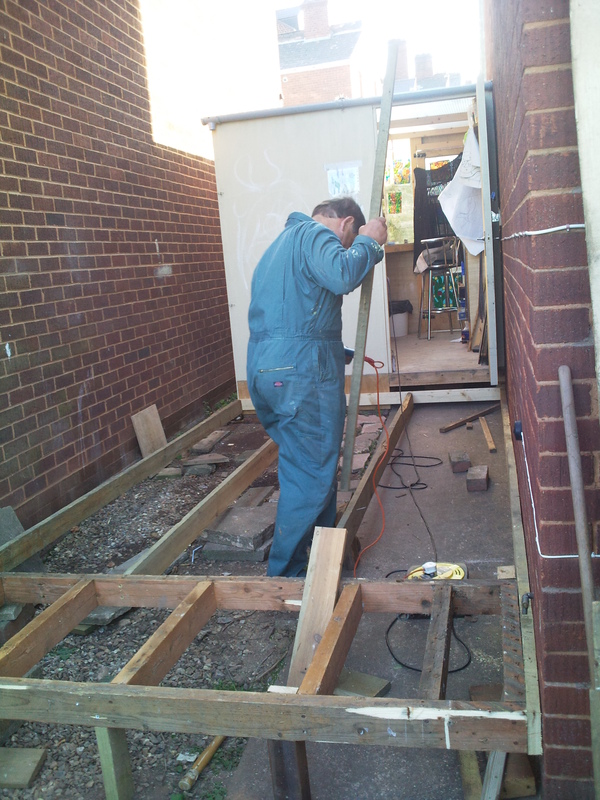 Getting stuck into something big! 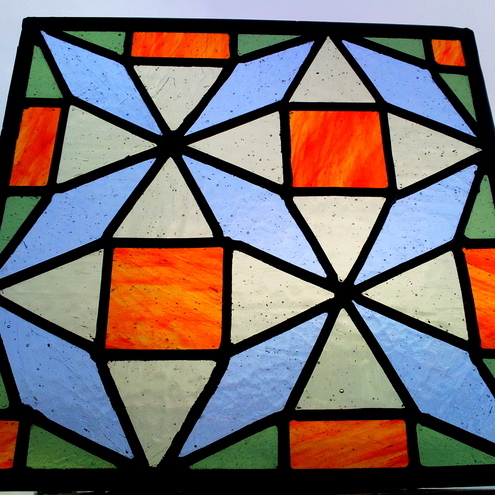 Way back in Autumn 2010 I started discussing a large window commission to be fitted into a double glazed unit for a family in Cambridgeshire, first the glazer was busy, so they missed their slot with me and since then I have been flat out with other projects. They have been very patient and finally I have made a decent start on their piece! The brief was for a design based on their favourite spot, Crackington on the North Devon coast to fill a large window looking onto a large porch/conservatory from the dining area of their home and bring some colour into their house. As soon as I saw the place sketching out designs was very straightforward, it is a gorgeous spot and I hope I can capture the mood of the scenery there. I always try to capture the spirit of a location, photo-realism is not my aim. 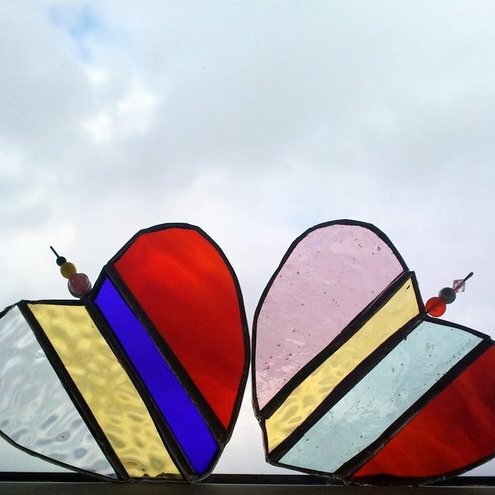 The design was agreed last year and then put on the back burner, which gave me a little bit of an artist block when I came to start cutting the glass, I knew the landscape needed a border but what that border should be has been alluding me for sometime! However, whilst looking into the shell framed mirror in my bathroom today inspiration finally came and I rushed off to my workshop to get going. The border is to be made entirely of different textured clear glass with lots of acid etched shells, seaweed and other sea life and today I painted all the PVA glue onto these pieces to act as a resist to the acid and acid etched in the flowers and grasses to the hillside in the foreground of the landscape. It is a big panel and I have a small workshop, so I had to stand on a bar stool to get a shot of the whole panel! The colours of the glass do not show up well or true on the white background of the cartoon, but you can get a rough idea. Anyway, there are some photos of the panel so far, painting on the designs and acid etching them.